Room dividers or partition walls create a private sphere where it’s needed – for example in open-plan offices, waiting areas or conference areas – and ensure useful partitioning in the home too. With partition walls made of ornamental or designer glass, the closed-off area also remains bright thanks to daylight, while the structure or pattern on the glass surface provides the necessary privacy. Ornamental glass is a translucent glass with embossed patterns on its surface. That reduces a clear view through it to a varying extent, depending on the structure and tint of the glass, but without daylight being blocked out. Some ornamental glass types also have a light-deflecting effect, from which darker corners of a room in particular can benefit. The range of structures and tints is wide, depending on taste and the preferred style. Ornamental glass is used in bathroom windows, in balustrades or vision panels in front doors, but also has a very decorative effect in interior design, for example in internal glass doors or partitions. 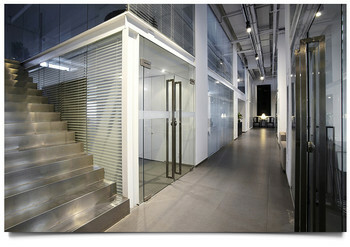 Glass acts not only as a transparent partition wall between indoors and outdoors. It also offers a wide range of options for the design of interiors – as a frameless inner door, as a partition wall, or as a room divider. Because glass can be altered and enhanced in countless ways: sandblasting or etching roughens the surface to create an interesting matt effect, printing using enamel paints allows permanent geometric patterns and even artwork on the glass, or full-surface covering with an elegantly shiny coating. For enhancing or renovating protected historic buildings, antique glass is a good choice. It is made using traditional methods and so exhibits the charming irregularities found in historic glass. With curved glass too, an enhancing accentuation is possible, for example in entrance areas, balustrades or display windows. Glass can be curved into almost any required shape, allowing the glazing to be adapted harmoniously to the building situation. In bathrooms too, glass elements provide the finishing touch. For example, all-glass shower cubicles or partitions of clear, tinted or ornamented glass ensure an unclouded shower experience. 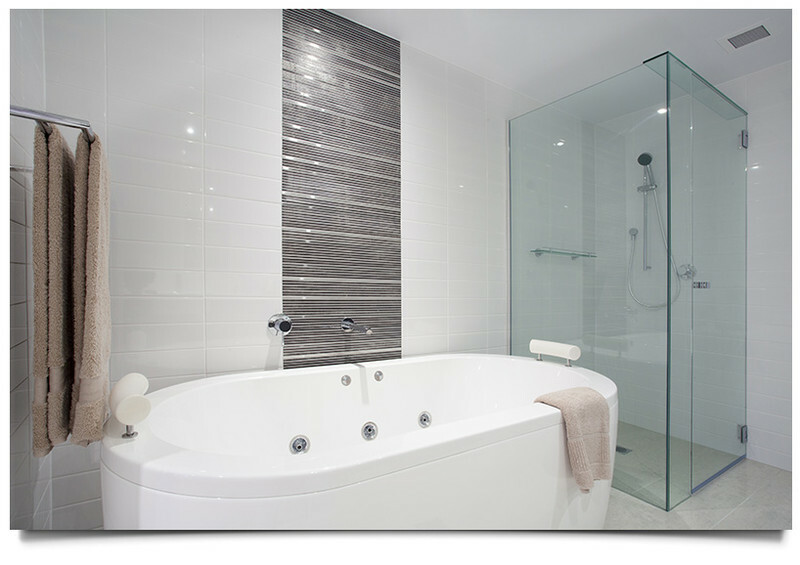 Glass is easy to care for, washable and hence hygienic. The glass can be provided with a special coating that causes the water to run off quickly and almost without a trace – so cleaning happens by itself: arguments that also apply for other uses of glass in the sanitary field. For example, washstands and washbasins, shelf structures, partition walls or floors can be designed both original and stylish using glass. In bathrooms and living areas, mirrors of course help people check how they look. But they are also suitable for use as decorative design elements. In irregularly shaped rooms they brighten up gloomy alcoves, they make rooms look bigger, and they have a demonstrably value-enhancing effect on the presentation of goods or exhibits. Antique mirrors best unfold their aesthetic effect in stylish surroundings. A special process makes these mirrors look “naturally aged”. They come in a range of colours. Ornamental glass with a metallized reflective coating is also original. It reflects the light diffusely and so brightens up a room without glare. In furniture making, glass is outstanding as a material in home furnishing. Cabinets, tabletops, shelves, complete tables or hi-fi units can be made from glass – as standard versions or as imaginative one-offs. For trade fair stands or sales rooms, the spectrum of possible applications is even wider. All methods of glass finishing can play a part here: ornamenting, sandblasting, enamelling, silvering – the range of possibilities extends from a simple showcase to a high-quality set.